•	Designed for I/O-intensive applications such as Microsoft SQL, Microsoft Exchange or SAN storage for virtualised environments. Axstor, announces the Ai-Pro 5108 SAS iSCSI storage array server, which delivers the industry’s fastest iSCSI storage combined with the largest number of ports and the lowest power footprint. With eight 1Gb iSCSI ports, the Ai-Pro 5108 provides the industry’s highest number of ports in a single controller, with performance of more than 80,000 IOPs from a single controller, and a data transfer rate of more than 800MB/s, make it faster than 8Gbps Fibre Channel. A power footprint of just 65w per controller provides a reduction of around 150 to 200w compared to competitor systems. The Axstor Ai-Pro 5108 can be configured with either high-performance SAS or SATA drives, allowing users to select the best disk technology for their requirements. Support for 7,200rpm high-capacity SAS drives up to 1.5TB, as well as high-performance 15k SAS drives up to 450GB, meets the need for high random-access performance, or low cost-per-Gigabyte. 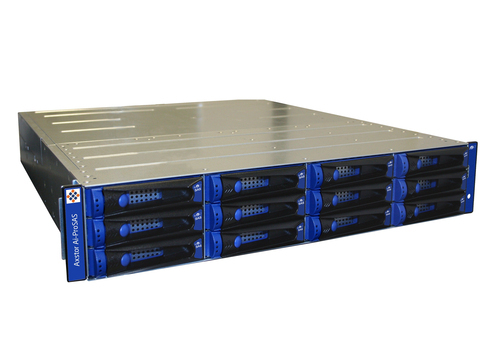 Supplied in a 2U, 12-bay chassis, the Ai-Pro 518 is fully dual-ported to ensure that there is no single point of failure. Initially supporting up to 60 drives and 90TB capacity, the system can be expanded to support 128 drives with the planned release of new firmware in January 09. Dual controller versions are planned for the third quarter 2008. The ability to handle both file and block-based data, provides support for SAS and SATA drives in intensive I/O applications such as MS Exchange as well as for SQL servers in VMware, Windows and Unix/Linux environments. “The introduction of this new benchmark for high-speed iSCSI storage will allow SMBs, enterprise and the public sector to meet new and aggressive targets for performance, capacity or reduced costs, whilst validating their green credentials.” Commented Alan Shepherd, Axstor’s CEO.